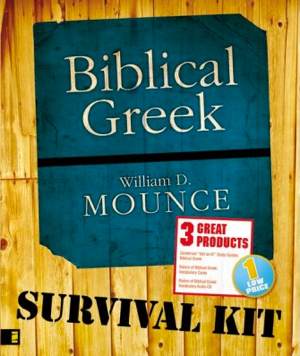 You can purchase the Biblical Greek Survival Kit online from ChristianBook.com or from your local bookstore. The audio CD (which includes mp3 versions of the sound files) are me reciting the vocabulary in the Grammar. The flashcards are 1,000 vocabulary cards; the first 340 or so are in the order the words appear in the textbook, and the remaining are in order of frequency. The laminate sheets cover most of the paradigms and a lot of the grammar you need to know Greek. I wouldn't try to learn Greek without these aids.